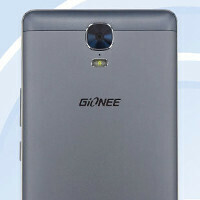 Just last month, we heard of a Gionee Marathon M5 launching in India. A midranger at heart, the phone has a 720 x 1280 5.5” display and is powered by a MediaTek 6735 SoC, coupled with 3 GB of RAM. What piqued our interest about it, however, was its massive battery – a 6,020 mAh cell, tucked under its rather hefty body. Today, a revealed TENAA post shows us another unit from the Marathon line – a Gionee Marathon M5 Plus will come with a larger, 6” AMOLED display with a 1080 x 1920 pixel resolution, 3 GB of RAM, and a yet unknown MediaTek octa-core SoC (maybe a Helio P10 or Helio X10?). In the camera department, the M5 Plus has a promising 13 MP camera in the back, and a commonly-seen 5 MP resolution on its selfie snapper. The phone will, surprisingly, have a smaller juicer in its trunk, but still a pretty impressive one – a 5,020 mAh cell will keep the Marathon M5 Plus' lights on. Of course, the large display and hefty battery take their toll on the phone's dimensions and weight – according to TENAA, the M5 Plus measures at 6.3 x 3.1 x 0.32 in (160.7×81.0×8.2 mm) and weighs 7.2 oz (206 g) – quite bulky. Now, whether any of these phones will make it to Western markets is yet unknown, but not impossible. In the US, Gionee smartphones are sold as rebranded products under the BLU smartphone brand. For example, the super-thin Gionee Elife S5.1, which used to be a contender for the Guiness “thinnest smartphone in the world” title, is sold in the US as the BLU Vivo Air. In Europe, Gionee smartphones can be found under the brand Allview. So, if you find yourself drooling at the prospect of an affordable phablet with decent specs and a ginormous battery – there's still a chance you might have access to the Gionee Marathon M5 Plus. Interested? definitely interested. I've been waiting for a Blu Studio Energy that doesn't come up short in the RAM department. M5 plus will be interesting. I'd take that over the Pure XL anyday (if both come with the x10). When will OEM's come up with a high-end phone with a massive 5,000+ mAh battery? All phones with big batteries have mid-range specs at best. Yep. I agree. I think HTC should go down that path to try to save the company. Differentiate themselves by offering a phone that actually competes by giving people solutions to problems instead of just another iPhone inspired design.